Carbonite’s products will be appearing on our web site shortly. Please contact us for quotes. 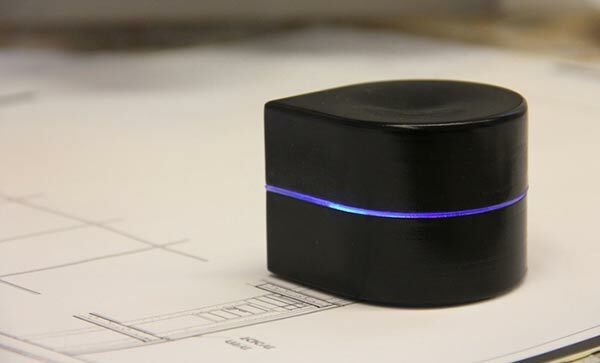 The Mini Mobile Robotic Printer by Zuta Labs is a Kickstarter project which has already surpassed the halfway mark of its US$400,000 crowdfunding goal in a single day. At the time of writing there are still $180 pledges available to secure a device (in black). Following an initial mass production run it is estimated that printers will be despatched to backers by January 2015. 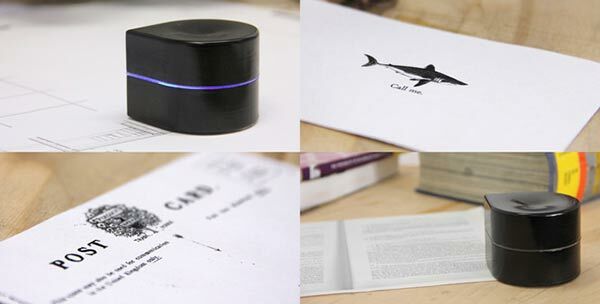 You use the printer by placing it ‘pointing’ at the top left of your page and it roams around laying ink down appropriately, propelled by its omni-wheel. The device takes data in via Bluetooth from your computer (mobile apps are also in development). Looking at the prototype it didn’t seem very quick and the team behind it quote a dawdling output speed of 1.2 pages per minute. With the device still in development and getting custom specially made components this might well improve. Physical dimensions and weight: 10 centimetres high and 11.5 centimetres in diameter and will weigh about 300g. Materials: cover made from Polycarbonate. Media sizes: any standard size. Print Speed: 1.2 ppm (estimated according to the prototype specs). Print Quality: currently the prototype can reach up to 96×192 dpi, the final product will have higher resolution. Ink Cartridge Configuration: one black cartridge, over 1,000 page capacity. Interface: Bluetooth, Bluetooth BPP, 1 x Micro USB. Battery: Lithium Polymer, Run Time (Up to) 1 hour, Charge Time of 3 hours. Supported Os: Android, iOS, Linux, OSX, and Windows. With its comparatively light weight and ‘pocket’ size it is thought that this portable device will be a favourite among mobile workers who often find it a struggle to print stuff out away from their base. Its rechargeable battery puts in a decent 1 hour of use which should provide over 60 pages on the go – when and where it is required. It will be interesting to see if the output resolution does increase in the final shipping product, as promised and if there will be any speed increases. UbiComp’13, September 8–12, 2013, Zurich, Switzerland. Xerox recently conducted raids in China and Dubai, resulting in the seizure of more than 55,000 counterfeit consumables and parts for Xerox products. According to the company’s press release, the merchandise was slated for distribution in the U.S., Germany, the Netherlands, Turkey, Russia, Brazil and South America. The company has also introduced its Geniune Xerox Rewards program, which includes a validation process that helps buyers avoid counterfeit products. Keep your business running at full speed with the Epson WorkForce 3520. The ultimate wireless all-in-one printer, the WorkForce Pro WP-4540 is twice the speed of inkjets. The Perfection V600 Photo offers 6400 x 9600 dpi for outstanding resolution and enlargements up to 17" x 22"
Get amazing big-screen entertainment with the Epson PowerLite Home Cinema 710HD. Go big with professional prints up to 13" x 19" and scans up to 11" x 17". Scan, save and send important data wherever your business takes you with the WorkForce DS-30 portable document scanner. The WorkForce Pro GT-S50 document image scanner offers an amazing value with its remarkable reliability, powerful performance and easy-to-use features. Scan 35-mm film, photos, documents, receipts, artwork, books, magazines, 3D objects and more. The Epson Perfection V500 Photo offers extraordinary quality and versatility with 6400 dpi resolution and an earth-friendly LED light source for greater productivity. Easy, HD Entertainment — Anywhere! *"Our Price" is for purchases directly from Epson. Dealer Prices may vary. All prices are in CDN Dollars. Free shipping applies only to Ground shipping – other options available at regular shipping rates. Use code MARBREAK at checkout. To ensure you receive emails from Epson®, please add EpsonCanada@Epson-Canada.rsys3.com to your address book. * The discount code offer is valid only on purchases from EpsonStore.ca on or before 3/7/2013 11:59 PM Pacific time and delivered in Canada. This offer does not apply to shipping costs or to Epson Clearance Centre products, Home Entertainment projectors (excluding MovieMate), or to Professional Imaging products (including hardware, ink, paper and media). This offer cannot be used in combination with instant or mail-in rebates, or other discount codes. Offer limited to stock on hand. Epson reserves the right to limit quantities. No dealers please. See Terms of Sale. Epson is a registered trademark and Epson Exceed Your Vision is a registered logomark of Seiko Epson Corporation. © 2013 Epson Canada Limited.